iHome Nha Trang i Nha Trang, Vietnam: Reservér nu! 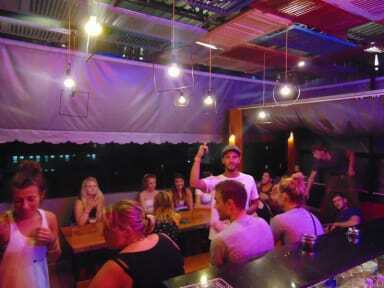 WELCOME TO [IHOME] - the only [PARTY HOSTEL] in Nha Trang, on the [ROOPTOP BAR] where you can get [UNLIMITED FREE BEERS FOR ONE HOUR EVERY NIGHT] and meet new other travellers in the hostel, we also serve [CHEAP DRINKS], [GOOD COCKTAILS] and [DELICIOUS FOODS] for you before the [NIGHT OUT]. 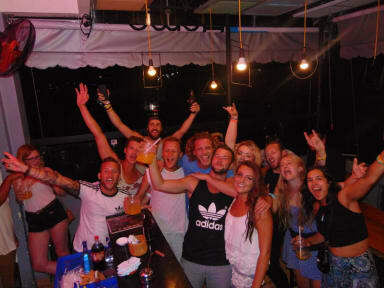 The hostel was specially designed for [BACKPACKERS] looking to experience a [COLOURFUL] [FRIENDLY] and [SOCIABLE] atmosphere. Especially, we are the first hostel have the [ESCAPE GAME CHALLENGE], the most excited way to play with friends and get a new experience. Come and try to break the room the get our valuable prize. NOTE: please ask the [TAXI DRIVERS] to turn on the [TAXI METERS] to avoid overcharging; we also recommend avoiding motorbike taxis, or at least make sure you settle on a [FIXED PRICED] before jumping on. was staying here during the storm, the hostel had no power and water sometimes but it wasn’t hostel fault cause it seems it's been cut off for the entire city. But the staffs were absolutely amazing, they tried the best to help with all we need. would love to come back here again. Ihome hostel was such a great place to stay. The staff were good at English and really helpful. They were always ready to start a party in the evening, when it was free beer hour. Especially Julia and max were the best! The rooftop bar is great. The dorms are nice with A/C, and the beds are big. Would definitely recommend to everyone!